Note that this pass shouldn't generally be marked as preserved by other passes. It's holding onto BFI, so if the pass does not preserve BFI, BFI could be freed. Definition at line 208 of file MachineOptimizationRemarkEmitter.h. Definition at line 64 of file MachineOptimizationRemarkEmitter.cpp. Definition at line 83 of file MachineOptimizationRemarkEmitter.cpp. 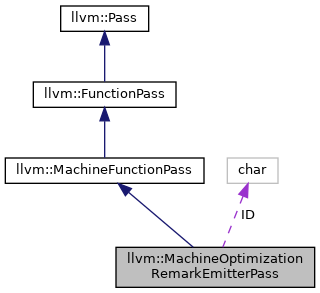 References llvm::AnalysisUsage::addRequired(), llvm::MachineFunctionPass::getAnalysisUsage(), ID, and llvm::AnalysisUsage::setPreservesAll(). 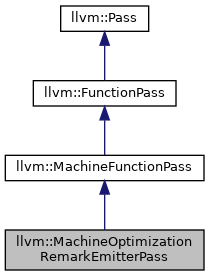 Definition at line 218 of file MachineOptimizationRemarkEmitter.h. Definition at line 70 of file MachineOptimizationRemarkEmitter.cpp. References llvm::Function::getContext(), llvm::LLVMContext::getDiagnosticsHotnessRequested(), and llvm::MachineFunction::getFunction(). Definition at line 223 of file MachineOptimizationRemarkEmitter.h.